Very widespread in North America. In Minnesota, uncommon to local breeder, uncommon to occasionally common migrant, uncommon winter resident. This bird is very well camouflaged. The head, upperside, and wings are a dark dull brown heavily mottled with brownish-white. When still on a tree trunk, it is difficult to distinguish from the bark. The rump is rich rusty brown. The tail is relatively long. The underparts are dull white. There is a white “eyebrow” streak above the eye. The bill is curved downward. A series of 5 or 6 high-pitched notes, 1 long followed by 4 or 5 shorter, lasting about 1½ seconds. Described as trees, beautiful trees, or trees-trees-trees see the trees. In the warm season, insects, insect larvae, spiders, spider eggs, and pseudoscorpions. In the winter, seeds and other vegetable matter. Mid-March to late May and September through November. 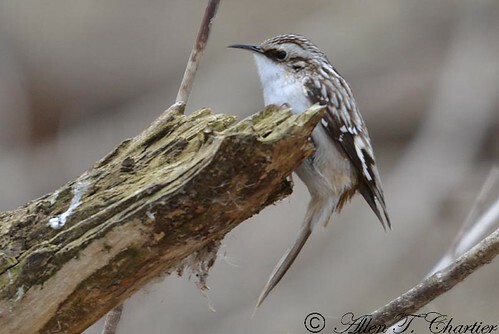 When foraging, the brown creeper begins near the bottom of a tree and moves upward with quick jerky movements, sometimes in a spiral around the tree trunk, leaning on its relatively long tail for support. White-breasted Nuthatch often moves downward, starting near the top of a tree trunk, though it can also move upward or sideways. The different direction of movement exposes different bark crevices to each species. Photographed at Grand Forks, North Dakota (22 October 2009). 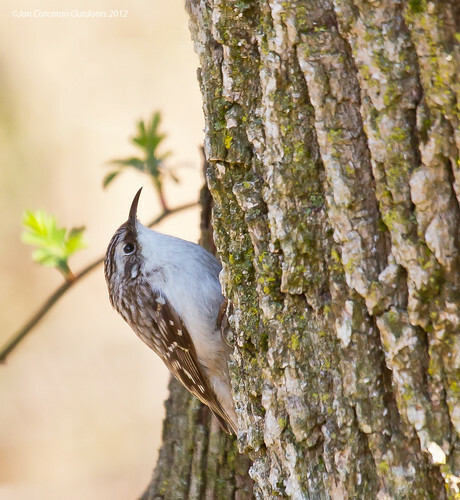 Brown Creepers (Certhia americana) at Lassen Volcanic National Park were found bringing food to their nest. I didn't see the nest at first and the birds were flying around me and vocalizing, flying from tree to tree and climbing, then flying near me and chirping at me. I finally figured out that I was near the nest opening and backed off to where they could get in to feed their young. You can see the adults going into the top of the nest opening and a few seconds later, coming out another adjacent opening lower between the bark. At the end of the video, I show you the actual entrance from the side where the adults are accessing the nest.